The 115th Congress was sworn in on January 3, 2017. 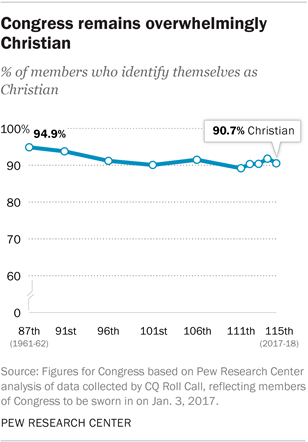 This Congress shares one interesting trait in common with its predecessors: it is overwhelmingly composed of religious individuals, especially Christians. And perhaps most surprisingly, our nation’s highest legislative body is even more religious than America as a whole. Indeed, only 11 out of 535 current congressmen and congresswomen identify as religiously “unaffiliated” or refused to specify, according to analysis released by Pew Research Center on the swearing-in day. In other words, Congress is at least 97.9 percent religious. Most congressmen and congresswomen (90.7 percent) identify specifically as Christians. Nearly fifty-six percent called themselves Protestants and 31.4 percent said they were Catholics. Pew reported that Mormons (2.4 percent) and Orthodox (0.9 percent) rounded out this demographic. Within Protestantism, Baptists rank highest (72 members/13 percent) followed by four Mainline traditions: Methodism (44 members/8.2 percent), Anglicanism (35 members/6.5 percent), Presbyterianism (35 members/6.5 percent), and Lutheranism (26 Members/4.9 percent). Additional Protestant traditions only counted fewer than ten members among their ranks. Sixty-four members identified as Protestant, but failed to specify a denominational or theological affiliation. Other religions represented included – in descending order of adherents – Judaism, Hinduism, Buddhism, Islam, and Unitarian Universalism. A combined total of 39 members of Congress (7.3 percent) said they were affiliated with these religions. Astonishingly the religiosity of Congress is considerably higher than America at large. Seventy-one percent of Americans describe themselves as Christian, according to Pew statistics. While significant, the proportion of Americans who identify as Christian remains nearly 20 percentage points lower than members of Congress. In particular, Catholicism and the four major Mainline traditions were overrepresented relative to the American population. Twenty-four percent of Americans told Pew they were religiously “unaffiliated,” and another 1.9 percent refused to say what religion they aligned with. Considering only 2.1 percent of congressmen and congresswomen had no affiliation or failed to identify their religion, this means Americans in general were nearly 13 times more likely to be religiously unaffiliated or unsure about their faith than members of Congress. Levels of religiosity in Congress have remained remarkably consistent for more than half a century. Statistics stretch back to 1961-1962 (the 87th Congress). While there are fewer Protestants in Congress now compared to previous sessions, they have been almost entirely replaced by Catholics and Jews. Five members identify as Orthodox Christians, compared to none in 1961. Thus members coming from a Judeo-Christian religious background continue to dominate Congress. The number of congressmen and congresswomen who ascribe to other religions or refused to say has barely budged. Indeed, exactly ten members ascribed to another religion in both 1961 and 2017, while those who refuse to say have nudged up only slightly. No doubt Pew’s data reveals that America remains populated by religious – particularly Christian – citizens. Surprisingly this is especially true in Congress. May God continue to grant America leaders who ascribe to His name.